I used the Tagxedo word cloud generator to create this art piece. I started by drawing a silhouette of Jabba, then scanned it in and uploaded it to the site. I had to play with the settings quite a bit, and I also tweaked the colors a bit in Photoshop afterward to get it closer to what I had in mind. 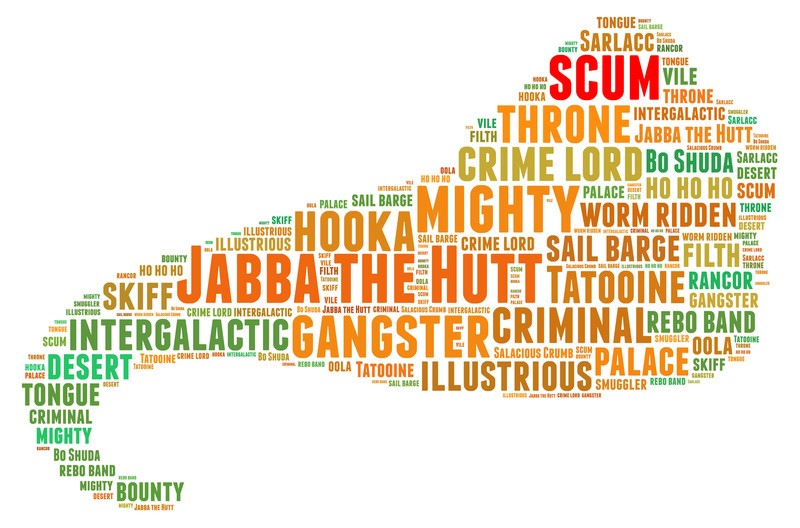 As you can see, it forms the shape of Jabba the Hutt using words associated with him. I think it looks pretty cool. If you click the image above, you can view a very high definition version that would be suitable for printing. You’re welcome to do that for your own private use. This is my first attempt at this kind of piece, and I think there is definitely room for improvement — such as using words to actually made up some detail inside in addition to just using a silhouette — but I think it came out pretty well.